You are here: Home / What Are Your Goals And Objectives? If you’ve gone through the process of clearly defining your mission and vision, you’ll need to consider what your objectives and goals are. These objectives and goals will allow you to realize your mission – vision. 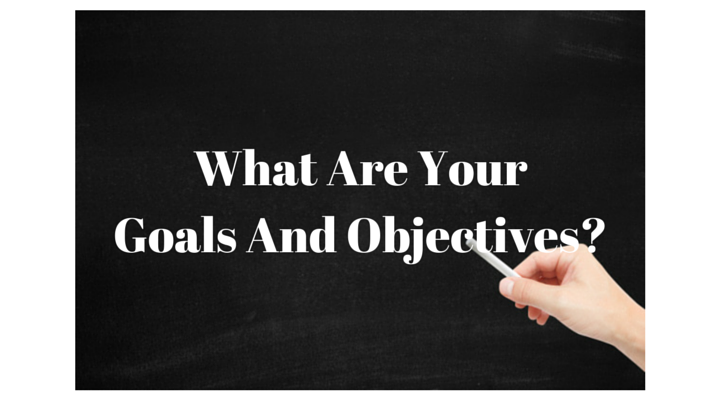 Have You Defined Your Objectives And Goals? Your objectives and goals can be broken down in several ways. For example by function areas, such as sales, marketing, PR, human resources, production, etc… Or, in simpler ways such as we need to sell more stuff, reduce costs, increase market share, hire more competent people, reach our audience, etc… In either case, defining these objectives and their accompanying goals and tying them into your mission – vision is important. Otherwise you’re a rudderless ship. Have You Considered How Online Marketing Will Assist In Achieving Your Objectives And Goals? Deliver target traffic to your website – For example, Google Adwords, a form of paid online advertising, can deliver target traffic to your website. This traffic is in the form of people searching for the goods and/or services you offer. This is different from a random print ad in which you hope that someone sees it and that they are in the mood for what you are offering. With Adwords, these people have been vetted to a great extent. Increase the awareness of your brand and/or business – If you’ve built up an audience on social media, your content strategy can be used to keep your brand and/or business at top of mind with your audience. Remember, you’ve already captured this audience to some extent and now its time to extend this relationship such as in the form of repeat business. Engineer your website for search prominence – In most cases your website will be at the core of your online marketing effort. You’ll want it to be found by your target audience so they can then perform the action you desire on it. As such the website, your social media and 3rd party directories must be engineered to be found by your audience. Amplify and assist your offline marketing efforts – If you are doing offline marketing such as radio, TV, mailings and print advertising you can use your online assets to support these endeavors. For example, if you are a location based business, make sure all your map listings are accurate and in order so when someone searches for your business after hearing a radio ad they’ll be able to find you Google, Apple and other map products. Generate more leads and revenue – These may be your top level broad based goals and objectives. The above mentioned examples are directly tied into supporting these top level goals and objectives. In summary, you need to make sure that your objectives and goals are clearly defined. Once you’ve done that, it’s going to be much easier to see how online marketing can help you realize your mission – vision plan and reach your objectives and goals.